There is a moment in the first episode of “Cobra Kai” that is so right, it cannot help but make one smile even as the YouTube Red show is setting up both inevitable conflict as well as a revivification of a decades-old rivalry. The scene I speak of happens when down-on-his-luck Johnny Lawrence (William Zabka) realizes that his beater car has been towed to the lot of LaRusso Auto Group, whose proprietor is, of course, none other than Daniel LaRusso (Ralph Macchio), the onetime scrawny Jersey kid who, 34 years after beating Johnny in the 1984 finals of the All Valley Under 18 Karate Championship, now owns a string of car outlets in the San Fernando Valley. Even casual fans of “The Karate Kid” will recall Daniel’s crane kick to Johnny’s kisser in the climax of that seminal film, which won him not only the championship, but the girl, Ali (Elisabeth Shue), to say nothing of two sequels. Word was that both Macchio and Zabka, who serve as executive producers on the online revival, were turned down all over town before YouTube Red picked up the series. 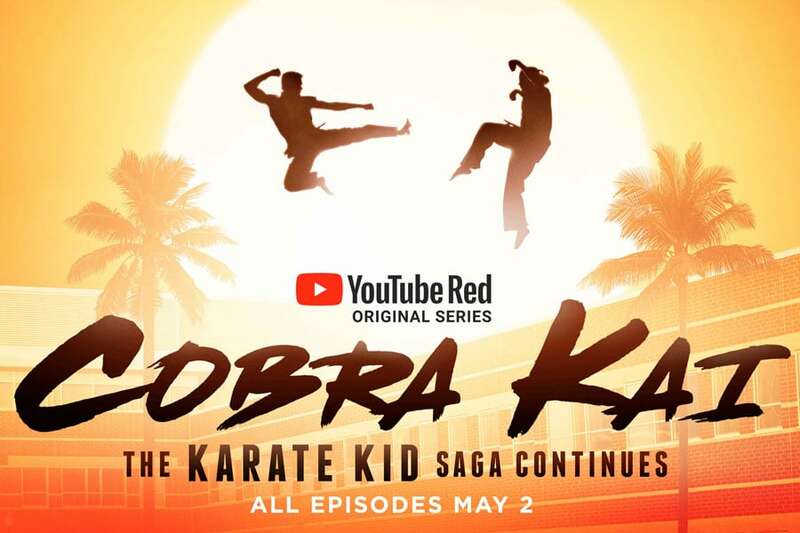 YouTube Red is a pay service (though many “Cobra Kai” viewers opted for the “free trial” and promptly canceled after watching all 10 episodes), and no DVD release of the series is planned. Meaning “Cobra Kai” was not something to be watched casually—you were in or you were out. So back to the scene in question. Because this is fiction, of course Johnny’s ride would get towed to his old nemesis’s dealership. Drama as far back as the ancient Greeks thrived on coincidence and irony—and, let’s be frank, there had to be some reason for Johnny and Daniel to rekindle their decades-old feud if “Cobra Kai” was going to have a chance. “Johnny? !” Daniel calls out after his former enemy has asked that his car be taken to another shop—and just as he was about to make it out the door. Rather than be cross, Daniel is…unbelievably happy. Not only does he smile at seeing Johnny, the guy who bullied him mercilessly in high school, but he actually hugs him. Never mind that Johnny cringes at the embrace; this is the most true moment of the show’s pilot, which thus far has followed the traditional path of a comedy. Time and tide wait for none, and they have a habit of healing all. Remember that these two blokes were last seen together as teenagers. Now middle-aged men, it is precisely accurate that Daniel, upon beholding his former—and vanquished—foe, would approach him much like, say, Muhammad Ali might happening upon George Foreman in the produce aisle. They may have been enemies, but, dammit, they shared something in the public eye. A moment, as teenagers, in another time and place. Daniel, now a successful businessman, gets to touch upon his youth in embracing his onetime opponent. Johnny, clearly none too happy with the touchy-feely moment, is anxious to end the reunion session as Daniel calls over his employees to reminisce about how, not only did Johnny bully him, but “I kicked him in the face” in the tournament. However, perhaps realizing that he is piling on the humiliation, in a strange, reversed echo of their teenage rivalry, Daniel’s gaze softens and he keys in a selection on his iPad, offering Johnny the “friends and family” discount of free to get his car fixed. If “Cobra Kai” had ended there, I would have been happy. The lessons of karate are not only in standing up for oneself but also in mercy and not kicking someone when they’re down. And yet nine-and-a-half episodes still remain. Nostalgia is in. Witness the raft of rebooted franchises like “Roseanne,” “Will and Grace,” “The X-Files” and “Murphy Brown” returning to the airwaves to both touch upon a feeling of pop culture of yore while bringing old franchises up to modern times. And I suspect I’m neither the only person who gravitated to the martial arts after serial viewings of “The Karate Kid” (as of this writing, I am a third-degree black belt in Isshinryu karate, which I began studying in 1987, the year after “Part II” hit theaters), nor the only one who both found the original film on demand recently—or, I am not ashamed to admit, downloaded both the soundtrack and score of ‘84 film as well. I am happy to report that “Cobra Kai” succeeds in spite of the soap opera-ish tropes of serialized television to which it must bow in order to fashion drama. Specifics will now be touched upon, so if you plan to watch the show and have yet not done so, spoilers begin…now. Before I dug into the show, my buddy Ryan warned me that “Cobra Kai” hinges upon perhaps a bit too much coincidence. I see what he means in that not only does Daniel’s daughter Samantha (Mary Mouser) unwittingly wind up dating Johnny’s top student, Miguel (Xolo Maridueña), but Johnny’s estranged son Robby (Tanner Buchanan), eager to get back at his pop for being an absentee parent all those years, takes a job at LaRusso Auto Group and soon enough becomes a student of Daniel’s—though Daniel at that point has absolutely no idea of his teen employee’s parentage. This is, of course, the foundation of irony. When one character—and, by extension, the audience—is privy to a key piece of information another is not, narrative tension is the result. There’s a reason the eavesdropping technique has been in use for so long: It works. To say nothing of the fact that many of the better scenes in movie history involve a character, typically horrified, beholding something he or she should not otherwise have seen. Think of Michelle Williams’ witnessing her husband, Heath Ledger, kissing Jake Gyllenhaal in “Brokeback Mountain,” but rather than making a scene choosing to sit on that information, as only one such example. The title “Cobra Kai” is also the right choice. If the “Karate Kid” series was Daniel’s story, “Cobra Kai” is about Johnny—though for some reason, Macchio’s name still appears before Zabka’s in the credits, which seems wrong. But it’s great how, after reopening the dojo, Johnny’s points of reference are nonetheless are as stuck in the ‘80s as he is, referring to women unironically as “babes” and asking at one point “what’s a ‘face book’?” Nary a scene passes without Johnny downing a beer or five, though even this is tenderly handled in a later episode when, in a bid to turn over a new leaf, as it were, he closes the fridge on the brewskies in favor of a fruit smoothie. Nonetheless, it cannot help but strike one as a bit difficult to swallow that Johnny’s life was so ruined by losing the tournament in ‘84, that he had peaked at age 18, such that three-plus decades have seen him accomplish nothing but becoming a deadbeat dad. Probably the “right” time to revisit the Daniel-Johnny rivalry would have been 10 years after the original film, but somehow it’s both sadder and funnier that Johnny is now a fiftysomething man who has, during 34 years of absence from the storytelling universe, awaited his moment to, uh, strike Cobra Kai-style. Making the exercise not only palatable but satiating is due immensely to the talents of screenwriters Josh Heald (“Hot Tub Time Machine”) and Jon Hurvitz (“Harold & Kumar”), who created the show and also serve as executive producers. Heald, Hurvitz and a roomful of other writers treat the material with the right amount of silliness, nostalgia and genuine comedy. The “Cobra Kai” scribes show a clear love of the material, evident in revealing how awkward is Johnny in his bid as a sensei, and not just allowing him to go from drunken wreck to successful entrepreneur. Sure, Johnny proudly tells his students he will teach them the style he learned and its three cardinal rules—strike first, strike hard, no mercy—but having an ethos and teaching it effectively to teenagers are two different ball games. Like his own sensei, John Kreese (Martin Kove), Johnny Lawrence runs Cobra Kai like some kind of a warped mashup of boot camp and personality cult. The difference is that while Kreese was the ultimate macho bully, drilling his disciples like Patton and cheerily eschewing the karate-for-defense-only Miyagi motto, Johnny doesn’t quite have down the fear factor. When questioned by his students, he’s fond of yelling “Quiet!” but unlike Kreese, it seems impossible to think of him putting one in a chokehold. Rather, Johnny’s students, at first, seem to view Johnny’s faux-tough teaching style with a laugh—some well-placed millennial razzing at a truly unhip, well-past-his-sell-by-date Gen X’er. And Johnny’s status as a dinosaur—see earlier note about the “babes” comments—is still further heightened when he initially says “no girls” to the tough-yet-sensitive Aisha (Nichole Brown). It’s Miguel, his top student, who convinces him to let her into the kai. Actually, it’s Miguel who convinces Johnny to do a lot of things. As often as not, Johnny ends class early to retreat to his office—and his beers. Miguel’s own father is absent, and in seeking advice from his sensei on such typical teenage pitfalls as dating and dealing with bullies, Miguel gets his teacher to come out of his self-created shell, and even invites him over for dinner—where, in a hilarious moment, Miguel’s grandmother says something rather unkind about him in Spanish, which Miguel, wide-eyed, fibs in the translation. Wordsworth once said that the child is father to the man, and so here, the student is father to his teacher. The writers also aren’t afraid to toss in a few well-intentioned inside franchise jests that, rather than directly winking at the audience (as nearly every other retread seems pathologically inclined to do), to appeal to true fans of the brand. The best of these comes in Episode 7, when Johnny implores a kind of Valley karate tribunal to have Cobra Kai reinstated from a lifetime ban from the tournament circuit. This, we learn, was instituted after the events of “Karate Kid III” due to the unsavory actions in that film of Kreese and his old Vietnam War buddy, Terry Silver (Thomas Ian Griffith). “Yeah, I don’t even know who that is,” Johnny says of Silver, who of course entered the franchise two films after he did, and thus well after he bowed out. It’s a quick little inside joke for the “Karate Kid” cognoscenti, and also one more roadblock in Johnny’s quixotic quest for legitimacy well outside his control. There are a few other callbacks–some large, some subtle–including a Halloween scene with someone dressed in the same skeleton getup worn by Johnny and his Cobra Kai mates the night Mr. Miyagi saved Daniel. And Miguel and Samatha’s first big date is at Golf N’ Stuff, where Daniel and Ali courted a generation earlier. As the teens cavort, “Young Hearts” by the band Commuter plays, the very song in “The Karate Kid” when Daniel returns to Golf N’ Stuff to try to set things right with Ali after a fight. Nonetheless, events continue to conspire to raise the stakes in the Johnny-Daniel rivalry, to the point in Episode 9 where Johnny goes to Daniel’s rather posh home to, what, pick a fight? Daniel is home and, sure, he’s down for it. Reverting to teens, the men square up and throw down macho platitudes worthy of the Arnold Schwarzenegger-Bill Duke hotel room fight in “Commando,” only to be interrupted by Daniel’s wife, Amanda (Courtney Henggeler). Rather than see the peacocking hotheads duke it out in front of her children—although Daniel’s son is cheering for precisely that—Amanda convinces the would-be combatants to, uh, talk it out. Daniel agrees to drive Johnny home, and on the way, amid icy wordlessness but with the radio on, the two begin to sing along together to…REO Speedwagon. No, I’m not kidding. “Take It on the Run” came out in 1980, so of course it’s a collective flashback. It’s also comedy gold. “But I’ll bet you wouldn’t know anything about that, would you?” Johnny hisses at Daniel, recounting his rough early life. One final point to discuss, and if you haven’t yet watched Episode 10 or read about it in the trades, stop reading now!!!! It was always a foregone conclusion that John Kreese would somehow return, and indeed he prances into Johnny’s dojo late one night, his face first shrouded in darkness, but that same serpentine, silky-voiced menace still so recognizable even in shadow. Johnny is frozen as his old sensei emerges in a dramatic reveal (is there any other kind? ), a cigar at his lips, telling his former protege that he always knew he could make good. Remember, the last time these two were together, Kreese was choking Johnny out after he lost the big match to Daniel. Now Johnny has made Miguel into a champ in his own right—with Miguel too sporting the same bad attitude of both his sensei and his sensei’s sensei. The cycle of Siths continues. How this plays out in Season 2, with Robby under Daniel’s tutelage and Kreese back in Johnny’s corner, remains to be seen.